Ross County midfielder Harry Paton. 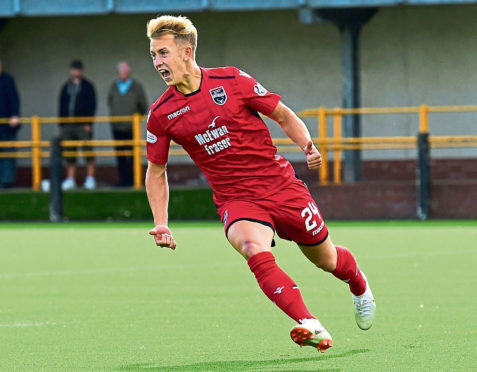 Ross County midfielder Harry Paton is eager for the chance to show former club Hearts how much he has developed when he returns to Tynecastle for tomorrow’s IRN-BRU Cup tie against the Jambos’ colts team. Canadian Paton was released by Hearts in the summer following two years with the Edinburgh club, before joining the Staggies on a one-year deal. After spending last season on loan with League 2 club Stenhousemuir, where he made 39 appearances and netted eight goals before winning the supporters’ player of the year award, Paton already feels he is reaping the benefits of his move to Dingwall. With County looking to name a much-changed team for tonight’s game against Hearts’ under-21s side, Paton hopes to get his chance to impress. He said: “If I get the chance to play, I’m really looking forward to it. “I feel I’ve learned a lot in this pre-season, working in a first team environment. With the way the managers have helped me, I’ve really benefitted. “It would be nice to show the people at Hearts that I’ve stepped up and improved. I’ve got a lot of respect for them. Paton made to move to the Jambos in 2016 having previously had a short stint in English football with Fulham, and despite his release in the summer the 20-year-old insists he has fond memories of his spell with the capital outfit. Paton added: “Ahead of the draw, I wasn’t expecting to be going back to Tynecastle this early in my Ross County career. “Obviously it will be against all my old team-mates. The Hearts under-21s squad is mostly unchanged from my time there, with a few who have pushed up into the first team. There are also some new young boys coming through. Paton has had to be patient for his opportunity with County, netting on his only substitute appearance so far after coming on as a last-minute substitute in a 2-0 Betfred Cup victory over Alloa Athletic last month. Paton hopes to catch the eye of co-managers Stuart Kettlewell and Steven Ferguson, and he added: “I’ve been doing my best in training here to impress and earn my chance. They’re looking to see where I can fit into the team. “I’m learning a lot every day. There is a lot of experience in the team in guys like Iain Vigurs who have played at a higher level.